In fact Iain Coucher is a Yorkshireman of London pedigree. A sharp sense of humour tempers an otherwise direct pragmatism. Iain Coucher has a fine eye for detail, unnerving those who speak of railways with less intellectual rigour. On the face of it Coucher has an unenviable task. Re-plumb Britain’s rail network with inadequate resources. Answer to a government that, under Byers and Prescott, has so far proved hostile to private railways. Motivate staff, increase capacity, reduce costs and improve performance. Perhaps a degree in Aeronautical Engineering from Imperial College London helps him rise above this for Coucher believes in long term, strategic thinking. No clackety-clack fire fighting for him, but the continuous welded rail of steely-eyed logic. Iain Coucher was brought in from Tube Lines and with city financier Adrian Montague set about constructing a new ‘Company Limited by Guarantee,’ which could deliver an effective and affordable railway. How? In three phases. Phase One: Production. Put bluntly, making trains run on time and controlling project costs. Phase Two: Efficiency, standardising processes, internalising maintenance, reducing reporting requirements and streamlining systems. Phase Three: Something of a new year’s resolution, and starting now, is to move the organisation up a gear and be more effective. This includes better communications, better ways of working. Coucher uses the term ‘world class’ drumming on the table as he does so. Working for EDS in mergers and acquisitions he was approached by a consortium comprising AMEY, Bechtel and Jarvis and asked to head up Tube Lines. It was in this role that he, ‘came across many of the officials at the Department for Transport.’ Happily this in no way put him off railways. His espousal of the cause must date from these days. Taking on Railtrack was a culture shock, surely? Coucher shakes his head and demonstrates that strange loyalty which has taken over so many rail chiefs who have found and obviously enjoyed the rail industry. Legend has it the pipe smokers went to Railtrack from BR while the chavs and cheeky girls tried their luck with the franchises. Coucher doesn’t flinch from the past, but equally won’t use it as an excuse for failure. ‘Like many, many organisations, we need to move forward. We spend too long looking backwards, navel gazing. The people who we got were largely very good. Some of them were not good enough and we released a lot of people quite early on. The Coucher- Armitt pas de deux aimed to offer a clear sense of purpose. ‘Staff were poorly organised in terms of roles and responsibilities, which is also what we tidied up.’ Managers and supervisors are now being better trained for what they do. Coucher believes in making better use of staff potential. ‘British Rail was particularly good at developing its people, it spent time and effort; a very public sector ethos. At privatisation, the industry lost that investment-in-people commitment. This was a generation of people that for a decade had had little structured investment. echnically brilliant, but poor managers. Many people, who had been promoted inside the organisation, were never given formal development or told what was expected of them as a manager, as a developer, as a communicator. Whilst they were very good at designing bridges, they were pretty poor at working with people.’ This curse afflicted all grades of managers and supervisors. World class? Wishful thinking? Not really, hard cash backs it up and Network Rail has in fact bought a school. Training takes place at Westwood College near Coventry, allowing staff to get away from the daily buffeting of the industry and train in peace. Sending them to Coventry? Ho, ho! Far from it. Can such a disparate organisation become standardised and up its game? ‘When we got here, there was an organisation of 15,000 people and yet there wasn’t a single HR system. Here is an organisation which has spent nearly £3 billion a year on capital investment projects, and yet there was no standard, modern project management toolkit. Clearly shocked Coucher goes on, ‘I come from a background of very focused, very tough challenges and detailed management. I spoke to one person, I said, ‘How many people have you got working for you?’ He said, ‘Oh, about 1400 - give or take about 200.’ He did not know how many people he had working for him. I came from an organisation where you would say ‘It’s 1417, but three people are going next week, two people are arriving next week,’ and you knew precisely. This type of discipline was not there. Coucher and his team have set about establishing common working practices and a certain centralised uniformity. The object is to increase the quality of production and ramp down cost. Why is the railway so expensive? Total blockades would be cheaper with massive economies of scale. ‘We are always under pressure from TOCs to make it (a possession) as small as possible. We seldom get a blockade. However, it is in the standardisation of procurement that the greatest savings can be made. Sitting in an office high in the Black Tower Coucher spells out his Calder Valley arithmetic. Coucher applies a mathematical logic to railway procurement, combined with a haggler’s instinct that would not be out of place in the souks of Damascus and Cairo. Will the former outsourcing expert be bringing renewals in house? ‘I have been very clear about when you should outsource and when you shouldn’t. The policy we have adopted is that you should never outsource a broken problem. Make it as efficient as you possibly can and then say to your outsourcing partners - go on then make that better. Deliver something that we can’t do ourselves. You’ve got to have either better economies of scale, access to technology that we haven’t. We had 20 contracts to renegotiate and we did our very best to try and renegotiate those contracts to a new form but we had to deal with multiple parties who had different ways of doing it. Again we had no commonality of systems... a lot of the contracts were cost plus, there was no incentive on them to reduce costs, there was no performance regime either, so we had a situation where we weren’t in control of what was done, when it was done and how much it was going to cost. We simply paid the bill and we took the performance hit when they got it wrong. Quite simply it was, ‘The most efficient TUPE (Transfer of Undertakings and Protection of Employment) transaction I’ve ever seen. We took 15,000 people from seven companies in less than nine months and the worst we got was three people didn’t get their fuel cards. It was text book stuff but it took a huge amount of planning. And a large dedicated team. It saves us £200 million a year, performance has improved, so we’re very pleased about that. And we said exactly the same thing to our renewals contractors. Slightly different thinking because we did renew our contracts. We put out new contracts 18 months ago. So we’ve got brand new contracts in and they are delivering. We have been quite clear - if you don’t give us what we want - and we think we can do it better - we’ll have to think about doing it ourselves. There’s no reason to suggest that’s the case. They are performing very well and the volume of rail renewal that we are doing and the volume of S & C renewal that we are doing is higher than at any time anybody can ever remember. The unit rate is coming tumbling down and we’re doing it much more efficiently and we’re doing it because we have better forms of contract. Can you explain the thinking behind Network Rail’s finances? The numbers involved seem mind boggling. 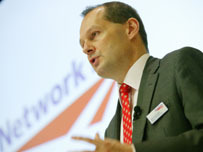 ‘Network Rail is an unusual company; in fact it is probably unique. The very simplistic message is: we are doing very well. We are ahead of all of our targets, about where we said we would be in terms of borrowing, performance and income and in terms of delivering the renewals with one exception - we are running slightly behind on the renewals of our signalling. First we are actually getting more efficiencies than we thought we would. So we are getting the same outputs for less money. Secondly, we made some estimates about when enhancement projects would come through - enhancements are normally third party funded. So we are seeing a phasing issue where we thought money would come in and it hasn’t; which is OK because it’s normally driven by third parties and it’s at their desire. The third area of under-spend is that we are challenging people a lot more and we are simply saying to people: we will not do work just for the sake of doing work. We will go out and make sure that we get a good price and renegotiate it and look at the scope to make sure it represents real value for money. OK. So how does Network Rail work? We get money in from government and train operating companies and that covers our expenditure. We can borrow to fund renewals or any shortfall in our income. We have an arrangement where we can borrow at very low rates - probably the most efficient private sector borrowing you can get. This year we will make a slight loss because we are not getting our full income stream from government, next year that will correct itself. We’ll make a profit. Network Rail is unique because of its funding structure but it is all subject to a huge amount of scrutiny by the regulator and the department and we are performing very well and we’re very pleased with it. I can understand the raised eyebrows but everything is under control and we can account for every single penny that we spend and explain every single piece of under-spend. Would you like to build the next new fast rail link? Is that something you are interested in? Personally I would like to be involved in a new railway. What a great thing a high speed 21st century railway linking the major cities would be. Journey times less than two hours? I think we are some way off. The West Coast is now a model project. It went through horrible teething problems; it has been a cause celebre in terms of major projects. When we got here we were facing estimates of £13 billion pounds. We took a firm control with the SRA which was much better at specifying public service requirements. All this is delivered with a firm finger tattoo on the desk. ‘We are delivering. We have mechanised our delivery.’ (tap tap) ‘Every weekend there are probably 10,000 people out on the railway at 100 work sites. Digging the railway up and putting it back together for Monday morning. We seldom get any over runs on the West Coast and now having thought about it and learnt best practice we repeat that week in week out. Can I turn to the man behind the...’ ‘Darth Vader mask?’ supplies Coucher helpfully. Hardly the mark of a secretive man. Lines are open now....! Many thanks to Kevin Groves and Jo Elliott for their help with this article.